Treasurer Josh Frydenberg’s maiden budget funds the government’s $3.5 billion climate and energy program that it will take to the election to battle with Labor’s ambitious renewable energy and carbon emissions targets. It includes $2 billion to replenish the Climate Solutions Fund – the rebadged Emissions Reduction Fund that Labor plans to abolish as a failure – although only $189 million of that will be spent in the four-year forward estimates window. It also includes a $1.38 billion equity injection for Snowy Hydro to help the government-owned company fund the $4 billion-plus Snowy 2.0 expansion, which will be contributed over six years during the building of the giant hydro expansion in the Snowy Mountains in southern NSW. The federal government took full control of Snowy Hydro in 2018 when it bought the NSW and Victorian stakes. As a reminder of the big financial risks of such a vast project, Snowy 2.0 is counted as a “fiscal risk” in the budget papers with project risks including construction delays, cost pressures and cashflow forecasts. An additional $56 million has been pledged for a feasibility study for the Marinus Link, a new high-voltage interconnector between Tasmania and Victoria. 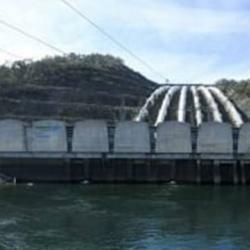 The Tasmanian and federal governments hope the second Bass Strait interconnector will make it feasible for Hydro Tasmania – the state-owned hydro giant – to build 3000 megawatts or more of new pumped hydro that can be used to “firm” the vast pipeline of solar and wind projects being built, or queueing up for approval, on the mainland. There is no funding mentioned for the 10 mostly firm renewable projects shortlisted under the government’s Underwriting New Generation Investments (UNGI) program – or the coal-fired power station at Collinsville in North Queensland that the government flagged last week under pressure from Nationals – because none of these projects has reached commitment stage. There is $13.5 million for administration for the UNGI program, which is yet to release final guidelines or a formal request for proposals even though the original 61 applicant projects have been whittled down to a shortlist of 10. An additional $79 million is being made available for the Energy Efficient Communities Program that funds energy efficiency measures – such as LED lights, solar panels, smart meters and other initatives to improve energy efficiency in community organisations and small firms. Labor announced on Monday that it would beef up the government’s Safeguard Mechanism by tightening caps to turn it into an effective cap-and-trade, carbon-trading system, something the government has been unwilling to do because it imposes a carbon price on industry. The budget also provides $75 million over seven years to support investment in network infrastructure, “despatchable” – or firm – generation – and reliable energy supplies, and $13.3 million additional funding for the Australian Energy Regulator to support its increased workload.